Abstract art separates reality of a subject through the use of imagery. Instead of an accurate, concrete image, abstract art instead conveys feeling, mood, color, movement and/or texture. While there is not a hard and fast definition of abstract nature photography, we can apply the principles found in abstract art to create captivating images. 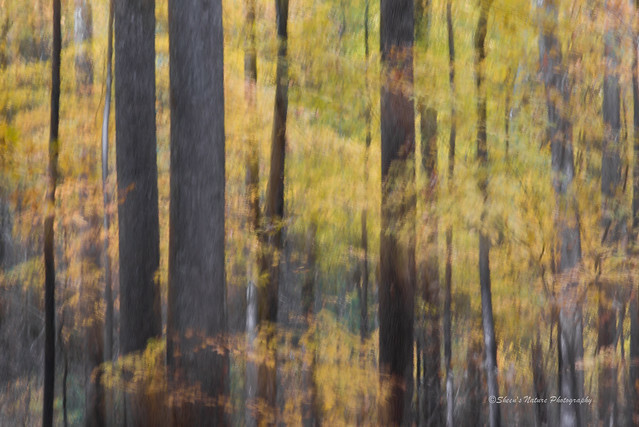 Exploring and using an abstract approach in nature photography positively impacts our creativity in 1) composition, 2) use of color, movement, lines and texture, and 3) post-processing. When delving into abstract, a key tip is to bring the focus to the elements of the subject versus the subject itself. Using the water reflection below image as an example, these trees and fall foliage along the stream's edge would have made a nice picture. Instead of photographing the trees along the stream and the reflection combined, I photographed only the colors reflected in the slightly moving stream. The result? A wash of watercolors, patterns instill a calm, peaceful setting on a mid-afternoon fall day. As a bird, wildlife and nature photographer, my subjects are typically very literal. For example, if I am going to photograph a bird, the viewer will see bird's details including the eyes, feathers, expression and any action at the moment of taking the picture. When exploring abstract, it's not the subject itself that is being captured. Instead, it's pulling the eye into the feeling, lines, color or mood. Composing the abstract encourages studying the details for ideas versus the ‘big picture'. A pelican's feathers often go unnoticed as their striking feature is their long bill and prehistoric appearance. However, the feather system is graceful and complex consisting of both long and short wing feathers that come together in a stunning display on their back. It may be the use of just color or any combination of these such as color/movement, lines/black & white, texture/color. The parts that make the whole are just as interesting, and some cases even more so. During a walk in the woods on a cloudy fall day, a group of us were studying the long lines of tall trees leading to the sky. Right in front of us was also a row of trees laced with gold and orange leaves. They were beautiful as is. Yet, there was a slight movement of the leaves from a light breeze. The area needed to be consistently shaded. Bright, small flashes or patches of light would have created distractions (ugly lines) in the background. If the light had been brighter, a neutral density filter could have been used. Used a small DOF (depth of field, f/16) and low ISO to get a 1/2 second to 1 second shutter speed. Focused on the non-moving trunk of one of the trees. 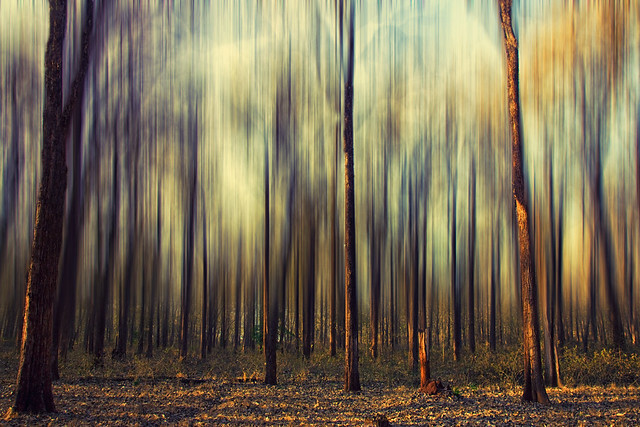 Here's another abstract forest view with brighter light and long slender lines. Lightroom, Photoshop and third party plug-ins have effects that can be used to enhance or even create something that wasn't there. Post processing options are numerous. 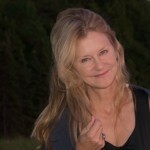 In Lightroom, softness can be enhanced by moving the clarity slider to the left. In Photoshop, using the Motion Filter can add the appearance of motion that may not have been captured in the original image. Google's Nik Software Collection offers a host of plug-ins that can add in or take away details to add depth, color and dimension. If you like the composition but it doesn't quite have the impact, post processing is where adding your artist touch makes the difference. But don't over do it! 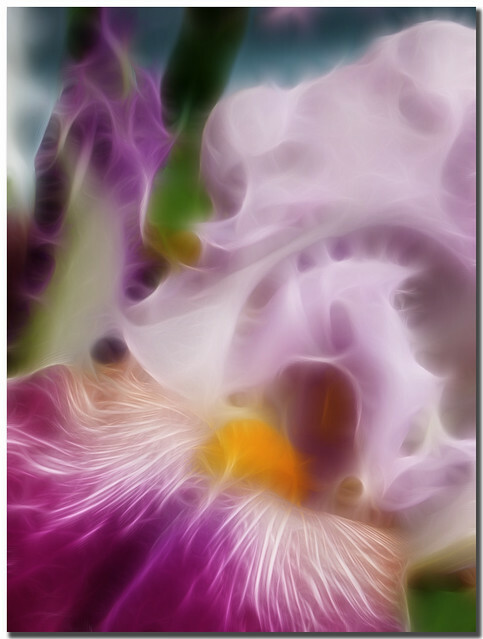 Abstract nature photography stretches our ability to find, see and capture the beauty of the individual details. To see abstractly, being intentional in studying the details is the first step.